When there are children involved in a divorce, their well being is the top priority of the courts and the chief concern of their parents. Determining child custody involves the issues closest to your heart, and we ready to help you fight for what is fair for your child or children. This is understandably a stressful time, but it does not have to be a contentious one. Ideally, with the right legal counsel, a fair arrangement can be created in a quick and peaceful manner. We can also help you understand the legal process as we navigate you and your family through the various steps towards a final resolution. Virginia Beach family law attorneys at McCormick & Calderón want to help you find the brightest possible future for both you and your child. There are two types of custody. One is legal custody, which is the ability to make major decisions for your child in regards to schooling, religious upbringing, and medical treatment. The right to have your child live with you is called physical custody. Ideally, the judge will want to preserve the child’s relationship with each parent. Of course, if there is a history of domestic violence on the part of one parent, sole custody can be awarded. There is ample room for variation to ensure that the child’s needs are met. For example, a court may award sole physical custody to one parent, but joint legal custody to both parents. When a judge determines child custody, the bottom line involves finding the child’s best interests. Many different factors go into this. A court will typically assume that the best interests of the child entail a healthy relationship with both natural parents, so a judge may be inclined to award joint custody. A judge will look at the child’s age and the relationship with each parent when determining this. The judge will examine each parent’s ability to care for the child’s emotional, physical, and educational needs. Another goal for the judge is to change the child’s lifestyle as little as possible. With this in mind, they will look at the other significant relationships the child has with their relatives and friends. Additionally, they will seek to listen to the preferences of the child, as long as they are of an age where they can think for themselves. The lifestyle of each parent is also taken into account, as even smoking could be factor that could impact the child. The judge will look for any history of substance abuse, criminal history, or domestic violence when determining the suitability of each parent to care for the child. It is also possible for parents to come to an arrangement themselves. After all, they are the ones who know their situation and their child best. They can negotiate a parenting plan and submit it to the court. If a judge agrees that the plan is in the best interests of the child, then the custody arrangement will most likely stand. The process of arranging a parenting plan can involve the professional help of a mediator. With the future of your family at stake, it is vital that you take the right steps to safeguard the safety and health of their future. At McCormick & Calderón, you can know that your case is in capable hands. 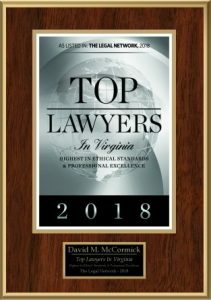 Our Virginia Beach divorce attorneys are committed to finding the unique solution that works best for your family, and we strive to do so through an amicable process. We understand that a divorce does not have to be a bitter parting of ways, but one through which you and your family can succeed in moving on to a stronger future. To find out more how we can help you and your family, please do not hesitate to contact our firm today.